If your skin is feeling parched and dehydrated, you will find relief by using a balm. How do you know which ones are best? Let’s take a look at the 5 best natural skin care balms to alleviate your dry skin. Why I like it: I initially bought this three years ago for my then 9 year old after he had stitches. His skin was extra sensitive, dry, and even beginning to peel around his wound. I wanted to find a fragrance free natural skin care balm and picked this up at the grocery store. I carefully applied this to his face and found it to be non-irritating and gentle. The balm helped to relieve the dryness and discomfort he was experiencing. Later, I decided to try the balm on my own lips and around the cuticles. I was pleasantly surprised by how quickly it absorbed into my skin. The balm moisturizes the skin easily and it never feels sticky. 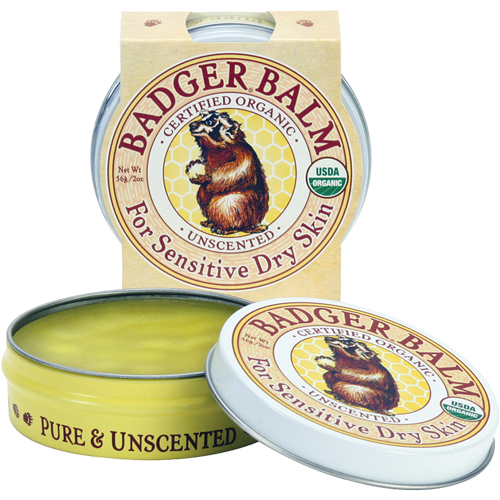 I highly recommend this balm from Badger. I confess: this is my GO-TO balm. I use this to remove my makeup, to tame the ends of my hair, as a cuticle treatment, heel softener, and even as a highlighter! Add a TINY bit at the cheekbone's highest point and you'll see what I mean. Why it works: Would you believe there are only two ingredients in this balm? These include certified organic olive oil and beeswax. Both are nourishing and protective to the skin, making it a truly effective product. Is it for me? Are you looking for a multi-purpose natural balm for your entire family? If so, this is the product for you. There is no scent at all, so men and those with sensitive noses will not object to this one. It is no frills and affordable, but works as well as other natural skin care balms. Why I like it: The scent of this balm is absolutely exquisite. It is a pure and natural blood orange, which is both tart and sweet at the same time. When you massage the balm into your skin, you will experience both skin care and aromatherapy benefits. The blood orange is invigorating and energizing, while the texture of the balm is soothing. When I use this product, I truly feel as though I am walking through a citrus grove. The scent is intense, as is the level of nourishment to the skin. Why it works: This balm is chock full of skin nutrients such as beeswax, jojoba oil, antioxidant vitamin E, and olive oil. In fact, this balm is 80% olive oil. The result is a rich, luxurious moisturizer suitable for even the driest of skin types. Is it for me? 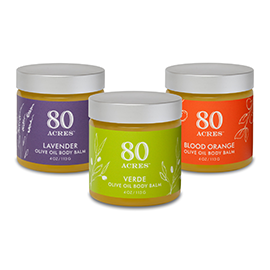 80 Acres makes spa-quality body balms. This is ultra-pampering and is a treat for those who love the aromatic nature of citrus scents. 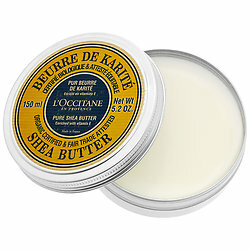 Why I like it: This shea butter balm from L’Occitane is one of my favorite balms because it can be used from head to toe. Whether it is to help repair split ends in your hair or to treat cracked heels on your feet, this is a multi-tasking skin care product. I’ve used this as an eye balm, lip balm, dry elbow remedy, cuticle cream and more. It truly is for everything. Why it works: The shea butter, pure and simple, is why this works so well. It is the only ingredient in this natural skin care balm, and it is an effective one. L’Occitane partners with women from Burkina Faso to source their shea butter, which is rich in vitamin E to soften and treat dry skin. Is it for me? This balm is ideal for those who like to splurge on their skin care products. It is more expensive than the other products, but the lovely packaging is gift-worthy and the tin is just adorable. It is not for those on a budget or for those with tree nut allergies. Why I like it: This lives up to the hype. Of all of the balms I have tried, I have found this one to be the best suited for dry hands and feet, flaky skin on the legs, and even as a hand cream. Unlike most balms, this one has ingredients in it to help increase the elasticity in the skin. There is a pleasant natural scent from the lavender and because of this essential oil, I find it to be incredibly relaxing. Despite this one being smaller than the others, I find that this one actually is the longest lasting because I only need to use a small amount. Why it works: This is a truly intensive balm because it features several different butters and oils. You will find nourishing avocado butter, shea butter, and coconut oil in this balm. In addition to these moisturizing butters, 100% Pure has added in sea buckthorn oil and antioxidants such as green tea. Is it for me? If you are vegan, this is a 100% vegan body balm. It is also gluten free for those who have Celiac’s Disease. It also contains anti aging ingredients so those with extremely dry facial skin may find that this serves double duty as a face balm. Why I like it: I was first introduced to this balm as a post-shave redness reliever. My legs often are dry, red, and itchy after shaving and I am always on the hunt for something to give me some relief. This balm is just what my skin needs. It plumps the skin to help it feel nourished and it also eases the itchiness on my legs. I love how this one is in a squeezable tube as opposed to a jar, so it is very user friendly. My legs are left feeling silky and soft. Shortly after applying, the redness fades away quickly. I also love the subtle vanilla aroma, as it is warm and comforting. Why it works: Aesop has combined a lovely blend of healthy ingredients such as macadamia seed oil, wheat germ, and soy to add moisture to extra irritated and itchy skin. Combined with shea butter and cocoa butter, even the driest of skin types will experience an increase in hydration of their skin. Is it for me? If you like to put skin care products in your handbag to take along to work with you, this is a must. 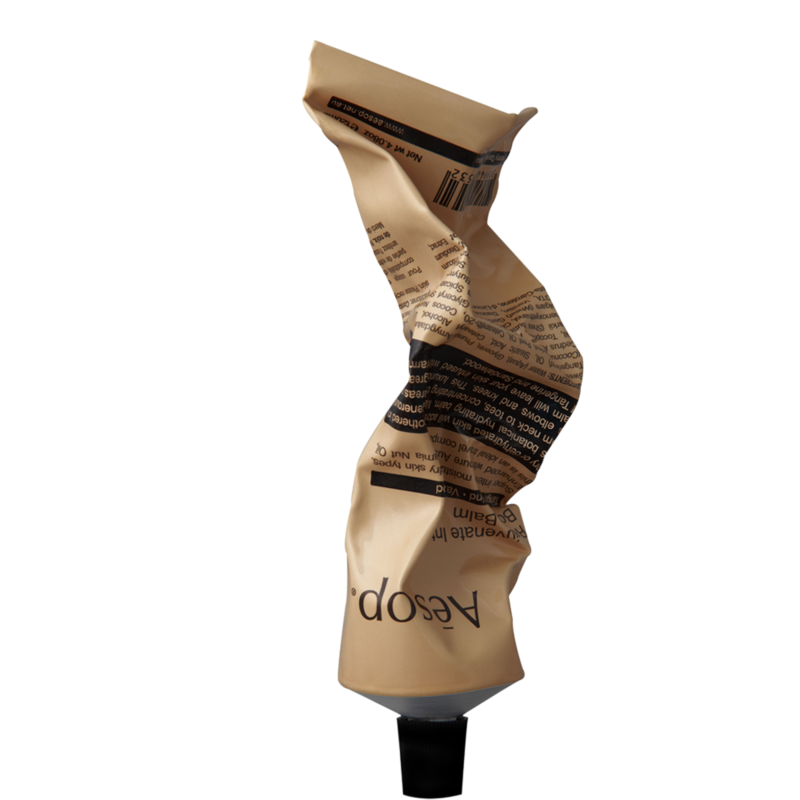 It is the only balm on our list sold in a tube, making it highly portable. If your skin is often irritated from shaving or waxing, this balm is ideal for you as well.